Ready … Set … PLAY! Coconut Creek, FL | April 8, 2019 – “Play Your Part,” a nationwide philanthropic event series hosted by The Toy Foundation (TTF), made its way to South Florida today, bringing brand-new toys and games to more than 250 children in need. Held in partnership with Junior Achievement South Florida at its Coconut Creek headquarters, the fun-filled day of play was made possible by local toy company volunteers and thousands of toy donations from manufacturers, retailers, and distributors to TTF’s Toy Bank. "We were thrilled to participate in The Toy Foundation's ever-expanding Play Your Part event," said Karen Kilpatrick, vice president of marketing at Jazwares. "It’s an integral part of the Jazwares mission to give back to the communities that we serve and support the education and development of children through play. Being able to work together to actively engage with children has been really special. We are connected in our desire to give back and bring happiness to as many children as possible!" 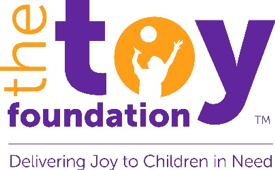 The Toy Foundation (TTF) is a 501©3 children’s charity whose mission is to provide joy and comfort to children in need through the experience of toys and play. TTF serves children who are coping with serious illness, enduring temporary home placements in the foster care system, suffering from abuse or neglect, experiencing separation from a deployed military parent, or dealing with devastating natural disasters. To date, TTF’s signature program, The Toy Bank, has provided more than $200 million in toys to over 26 million children in need around the globe, thanks to its generous toy donors.